Moose Javians may have successfully won an on-line voting competition to have the city declared the "One Horse Town", drawing accolades from both City Hall and tourism officials. But our penchant for on-line voting has now given Moose Jaw the dubious honour of having not one, not two but THREE of the Top Ten Worst Roads in Saskatchewan. This designation is not likely to receive similar accolades. High Street West is so far the leading candidate for worst street Saskatchewan. The roadway is awaiting completion, after being part of the Phase Two Cast Iron Water Main replacement. It is waiting repaving but at the same time is at least partially mired in a brewing legal dispute between the City and the contractor. In eighth place is 9th Avenue SW, which has undergone plenty of construction as well, and has not even come close to it's former glory. And now 1st Avenue SE (the One Ways just north of the Snow Hut) is in tenth place. This strip of road seems to be closed off, nearly as often as it is open. 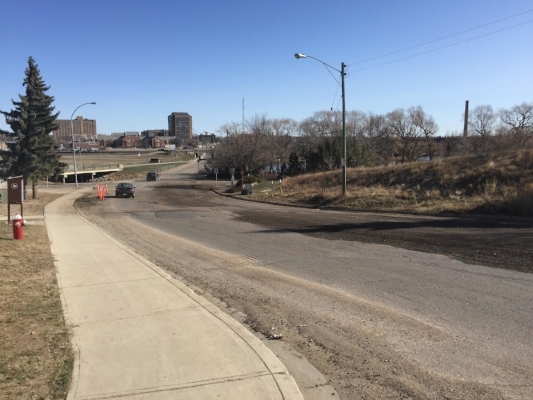 Each year as part of a safety initiative, the Saskatchewan Division of the Canadian Automobile Association (CAA) runs an on-line contest allowing people to nominate and vote for the Worst Road in the Province. “Typically the worst roads have potholes or crumbling pavement, poor road signs, lack of cycling or walking infrastructure, or traffic congestion. With that in mind, a worst road could be a residential street or a provincial highway, as both are examples of roads used by many road users including pedestrians, cyclists, drivers, and motorcyclists,” Christine Niemcyzk, media relations officer said in a news release. This year’s campaign is not just geared for automobile drivers but aimed at everyone using the road, Niemcyzk wrote. The release from CAA also included from the Saskatchewan Paramedic Association (SPA). "Vehicle dependability as well as paramedic and patient safety are directly related to the condition of the roads they travel. This is compounded exponentially when one considers variables such as adverse weather conditions, high speed responses, and many additional risks involved during an emergency response," Trevor Lowey, SPA Interim Executive Director is quoted stating in the media release. It needs to be noted that the ambulance service for Moose Jaw is located on High Street West. The contest is open to anyone to nominate or vote for the road of their choice. People can vote every 24 hours and encouraged to vote early, vote often and vote for the Worst Road in Saskatchewan. * Submit your voter information - keeping in mind it's one vote per road per email every 24 hours. During the voting process, a maximum of 3 photos can be uploaded. Please ensure you are in a safe location before taking photos of your worst roads. It also needs to be noted other urban roads in other cities have been nominated but none have made it into the top ten. Voting continues until May 6th with the dubious winner announced May 7th to the provincial media, decision makers, municipal and government officials in hopes off improving road safety.